Tucked away throughout the book is “history you can hold”—authentically reproduced letters, diary pages, maps, sketches, official orders, and artifacts from Washington’s life which can be removed for close examination. Through these reproductions, the reader can study and enjoy primary-source materials normally accessible only to historians. Never has the reader had the opportunity to examine George Washington’s extraordinary life and times in such a personal and intriguing way. 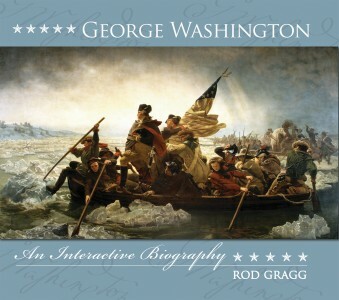 Rod Gragg is the author of numerous works of history, including The Declaration of Independence and Lewis and Clark on the Trail of Discovery, as well as Planters, Pirates, and Patriots: Historical Tales from the South Carolina Grand Strand and Robert E. Lee: Character and Valor, both from Pelican Publishing. His books have won the James I. Robertson Award, the Douglas Southall Freeman Award, the Jefferson Davis Medal, and the Fletcher Pratt Award and have been selected for the Book-of-the-Month Club, the History Book Club, and the Military History Book Club. A native of Conway, South Carolina, he earned his BA in journalism and MA in American history from the University of South Carolina. He and his family live on the South Carolina Grand Strand. "Not many people will ever have access to the written version of the inaugural address that George Washington penned himself when he was first elected President of the United States.